Since upgrading this blog a few weeks ago, I now know much more about who is reading it and what brings them here. Some of that information is a bit surprising. For example, I would not have suspected that people from Australia to Estonia hunger for blog posts about sheds. Who knew. At some point I will have to do an in-depth exposé on our shed. But I was not surprised that the overwhelming reason that people are checking in is for the cordwood. Which is really what it’s really all about! 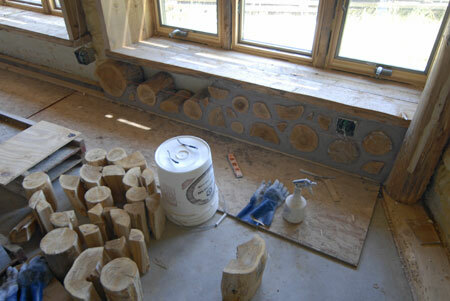 At long last we are getting back to talking cordwood, and not a moment too soon. One fine day last July, we finally got started on the inner walls. Our old friend Dave Bach stopped by with his friend Mark, who was interested in cordwood, so we turned the day into an impromptu workshop. Greg mixed up some mortar, I set out some logs, and we all got to work. We started on the south wall, which features three large window bays. Cordwooding on the inside went rather quickly. With three people mortaring, the narrow spaces beneath the window bays started to fill in. The next weekend we started on a larger wall. Here you can see the string lines we use to keep the wall plumb. It’s important to have several walls going at once, so you don’t have to work at the same height in the same position all day. 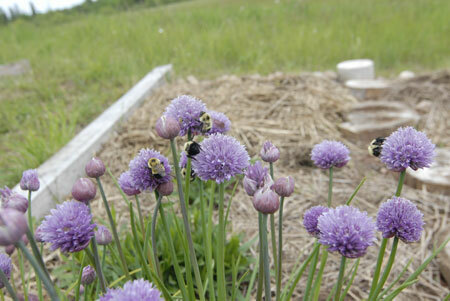 As busy as we were, we could not compete with these bees outside in the garden. i looks like the inner cordwood is not as deep as the outer. is that true?? if not why not?? wouldn’t it be a lot easier? i can’t imagine you need more r factor. Hey Dan, sorry I did not reply sooner. The inner wall is the same depth as the outer, because yes, it’s a lot easier. Great progress. 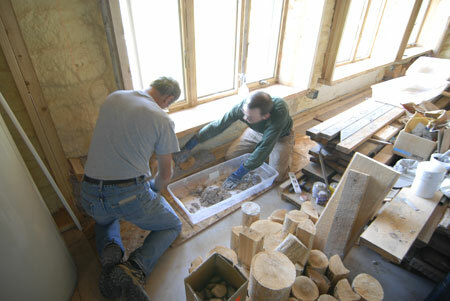 How much time do you spend putting up the mud & wood for say an 8′ section of wall – assuming all the wood & mortar is at hand? 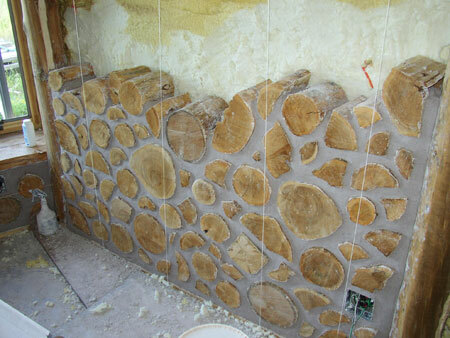 Considering building a small cordwood sauna with 8″ walls and just can’t really grasp the amount of time it could take. 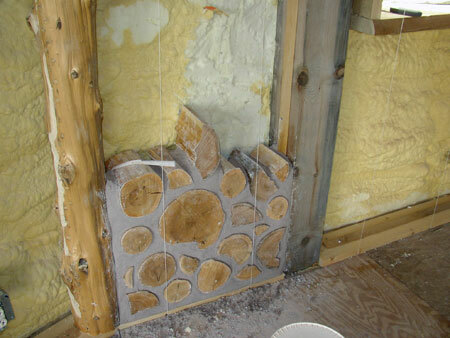 A solid 8×8 wall (no window or door openings) would take about fifteen batches of mortar. 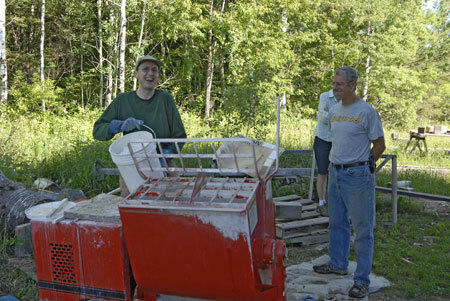 Each batch of mortar takes the two of us 2-3 hours to lay up, so we normally get three batches done in a full day. Thus, it would take five solid days of non-stop cordwooding. Next PostNext The Mysteries of Bottle-ends Revealed!